It is a long tradition: It is about „Create.Furnish.Live.“ in the beginning of every year. That’s the motto of the IMM Cologne, the famous furniture fair, which opens its gates since 1949 every year. More than 1200 expositors present their products in 15 halls from the 13th to the 19th of January 2014 to distributors, journalists and interested visitors. 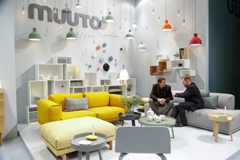 The first furniture fair of the year presents the newest trends of furniture and design, from the simple basic designs up to the new luxury trends. 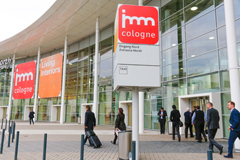 As one of the biggest furniture fairs of the world, the IMM also has a lot to offers across the borders of the fair halls: The Passagen (Interior Design Week Cologne) show furniture and arts in showrooms, galleries, furnishing houses, cultural institutes, museums and colleges in the whole city. And also the Designpost are another highlight with longer opening times and own surprises. There is another specialty on the international furniture fair IMM, which meanwhile established: The award of the A&W-Designer of the year. The big prize of the magazine Architektur und Wohnen (German Webpage) was given to the German Werner Aisslinger. Aisslinger already won a lot of prizes in his life: the Design-Plus-Award, the product design prize of the Federal Republic, the Red Dot Award and the Compasso D’Oro are only some of them. But a real accolade came now: Werner Aisslinger is A&W-Designer of the year 2014! The Juli Armchair made by the born Nördling was already included in the collection of the MoMA in 1998, the famous Museum of Modern Art in New York. Aisslinger won nearly all the important design awards since then, and the list becomes a bit longer in 2014. To become A&W-Designer of the year is one of the biggest honours given by the world of design. Since all the winners became renowned designers and Werner Aisslinger can now be named in one phrase together with Achille Castiglioni, Philippe Staarck, Ross Lovegrove, Konstantin Grcic, Ronan & Erwan Bouroullec and some more famous creators. It seems the work for Ron Arad was worth it for Aisslinger already during his studies. His mentor received the prize before in 2004. Ten years later his ancient apprentice also reached the top. A&W especially raises the versatility of the “visionary all-rounder”. Aisslinger nominated the designer Gesa Hansen for the Mentors’ Award, given by the designer of the year himself. It is likely for Aisslinger’s products and himself to become even more interesting now that he was accolade by A&W in 2014.